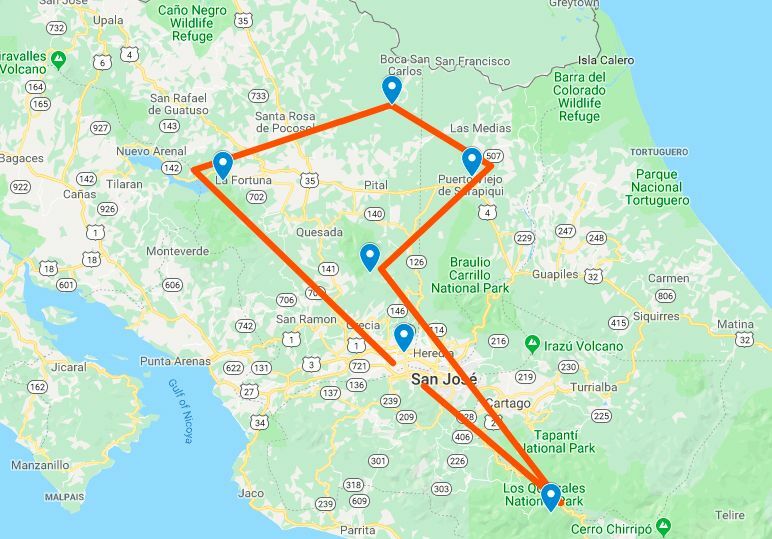 Your guide will meet you at the SJO Airport and drive with you to the town of Heredia, just outside San Jose, to the lovely Hotel Bougainvillea. Your drive is just 20 minutes, then you arrive at your quaint hotel, famous for its lush tropical gardens. After check-in, enjoy a stroll through the gardens. The Hotel Bougainvillea is a great spot to see several species of birds that can be hard in other parts of the country. Those species include the Prevost’s Ground-Sparrow, the White-eared Ground-Sparrow, and the White Naped Brush-Finch. The lush, beautiful setting is the perfect backdrop for some spectacular pictures. Enjoy an early morning breakfast, and depart for Arenal. Enjoy your stop at the La Tigre Hummingbird gardens. Your guide will help you spot a wide variety of hummingbirds as well as Tanagers, bananaquits, and more. Top Hummingbird Species: White Bellied Mountain Gem, Violet Sabrewing, Green Hermit, Purple-throated Mountain Gem, Green-crowned Brilliant, Violet-Crowned Woodnymph. After check-in, meet your guide for an afternoon of birdwatching and photography in the gardens and on the ground of the lodge. The feeders and gardens are teeming with Tanagers, Honeycreepers, Parrots, Flycatchers, and Hummingbirds. This morning you will enjoy a great day of photographing birds on the grounds and trail at the Observatory Lodge. This area is alive with so many different species of birds, you will need a quick eye to spot them all. There are more than 500 species recorded in this area. The diverse landscape includes primary and secondary forest, pastureland and even hardened lava flows. From the gardens, you will continue into the jungle trails looking for Antbirds, Tinamous, Doves, and Quails. This afternoon you make an excursion to the Bogarin Gardens. Bogarin is an absolute must visit for ANY birder wearing binocs or carrying a camera. Thanks to the dedication, perseverance, and hard work of local naturalist Geovanni Bogarin, you can walk a good, easy trail through second growth and wet areas that host the most reliable location for a wide variety of bird species. Some of the top species include Uniform Crakes, Rufous-tailed Jacamars, Rufous-winged Woodpecker, Barred Antshrike, Long-billed Gnatwren, Black-crested Coquette, Golden-winged Warbler and Mourning Warblers. You will have time for the trails and the feeders, to get your perfect shots. Today after breakfast you will travel with your guide to the small town of Boca Tapada and the rustic Laguna del Lagarto Lodge. Laguna del Lagarto Lodge, at Boca Tapada, San Carlos, Costa Rica, offers genuine contact with nature. Exuberant trails in the tropical rainforest allow for direct access to nature. 150 species of trees, monkeys, caimans, coatis, red frogs and the symphony of 350 species of birds – the most wanted dream of bird watchers and photographers – are all part of this enchanting experience. Laguna del Lagarto Lodge comprises 500 protected hectares that can be toured in different ways, by foot, by horse or by boat, and each trip will leave you with a great impression. The Lodge has specially located platforms to take pictures of birds at a strategic distance of no more than four meters. For photographers and lovers of nature, Laguna del Lagarto is a must for any visit to Costa Rica. This afternoon enjoy a special session, on a specially designed photography platform to photograph the elusive King Vulture. Remote areas of undisturbed, dense forests are not always the best places to photograph birds. Agricultural areas, gardens with fruits, edge-habitats often attract many more species, and the situation is no different in Costa Rica. To take advantage of the incredible array of bird species in the Caribbean lowlands, we will visit the hide in the backyard of a local inhabitant of Santa Rita, a nearby village. Adolfo’s Gardens is superb. This hide has very quickly become one of our most popular locations for bird photographers and you’ll spend the morning getting your best shots. This afternoon you WIll visit the special hummingbird garden at the Laguna del Lagarto Lodge to photograph a wide variety of hummingbird species. Bosque de Paz, is a lush jungle paradise, surrounded by magnificent cloud and rainforests, in the middle of Costa Rica. In this Lodge, you will discover great natural beauty, an abundance of crystal waters and the richness of some extraordinary forests where the privacy and the personalized service form a unique and unrepeatable experience. Live the experience of being able to breathe the purest of mountain air, while resting or walking through the jungle, without any environmental pollution and in complete peace and tranquility. This small rustic Lodge is made up of 12 very spacious rooms, pleasantly decorated with Costa Rican handicrafts, providing a comfortable and cozy atmosphere. Each room has two double beds, a private bathroom with hot water and ample balconies to admire the magnificent landscape of our mountains. Spend the afternoon exploring the gardens, feeders, and grounds of the lodge. Today after breakfast you’ll visit the Bajos del Toro Waterfalls and gardens. Bajos del Toro Costa Rica is in the Central Highland area next to the Juan Castro Blanco National Park. This area offers visitors a chance to explore a relatively unknown part of Costa Rica. This tropical rainforest area is famous for its beautiful rivers, pools, and waterfalls. This area has unique and intriguing eco-systems distinct from other parts of Costa Rica. This secret gem of an area is excellent for hummingbirds, toucans, hawks, and trogons. The afternoon you’ll return to Bosque de Paz Lodge to continue photographing the birds visiting the feeders and gardens. On the way to Sarapiqui you’ll make a very special stop at Alvaro’s farm. Several years ago a farmer, Alvaro, living in a remote part of Sarapiqui was given an injured Macaw. He nursed it back to health and made it known that he would care for more injured Macaws if they ever became available. After a while, one by one, he was given four more. All the birds made a full recovery and they have since bred and there are now around twenty Macaws at the farm. They all fly freely and rarely move far from the farmhouse. There are both the Scarlet Macaws and the Great Green Macaws here. The birds have really bonded with this special farmer and will follow him from tree to tree for a few peanuts. This means that there is a pre-determined flight-path, so photographers know exactly where to stand to capture the birds in flight. As well as photographing the Macaws in flight, there are other opportunities to get amazing perched shots of these birds from very close distances. You will photograph them both at eye level and higher up in the trees. After Alvaro’s you will continue on to your hotel. Sueno Azul l is known for its rustic ambiance combined with modern comforts. This unique hotel continues to give homage to indigenous civilizations from the Sarapiqui area. With 55 ranch style rooms with a/c, ceiling fans, private terraces with views of the garden and forest, Sueno Azul (blue dreams) is the perfect place for enjoying the lush forest of the area. The on-site restaurant, El Corral, serves a delightful array of local specialties. They use locally grown produce to give guests an authentic dining experience. Enjoy the early morning in the gardens of Sueno Azul, then after breakfast visit a local birding and photography site, Cope’s Gardens. Cope’s garden, owned by local birder and artist, Jose Albert Perez is an amazing retreat for birders and photographers. The finca has a small but very productive pond and feeder set up. Common visitors include various tanagers, toucans, Pale-vented Pigeon, Hermits, Bronze-tailed Plumeleteer, and many other hummingbirds. The vocalizations of Slate-colored Grosbeak and Striped Cuckoo from nearby in the garden will remind you of the high avian potential in the area. Other visitors to Cope’s garden include the Pygmy Kingfisher and the Russet-naped Wood-Rail. Cope is often familiar with the roosting site of several owl species, including the Crested Owl. You’ll have time for photographing owls, if there are some in the area. Other species known to the gardens and surrounding areas: White-ringed Flycatcher, Purple-throated Fruit Crows, Semi Plumbeous Hawks, Brown-hooded Parrots, and Thicket Antpittas. Today you depart the steamy Caribbean for the cool Talamanca Mountains. You’ll make a stop at the Cinchona feeders for your first chance to photograph many highland species. Cinchona is a fantastic place to visit feeders and have the opportunity to photograph Barbets, Tanagers, Hummingbirds, and Toucanets. The observation deck puts you at eye level with a wide array of feeders. Enjoy a hot cup of coffee, relax and watch for your favorite species. Quetzal Paradise Lodge features extensive gardens, rustic, wooden bungalows and a fantastic terrace with views of the cloud forest. It is located just 3 km from Los Quetzales National Park. The bungalows offer basic but comfortable furnishings, coffee maker, wardrobe and a private bathroom with shower. The on-site restaurant offers panoramic views of the forest, valley and surrounding mountains. The property sits amidst 12 kilometers of trails, open for use for all guests. This afternoon we’ll arrange for the feeders to be well stocked so you can set up with your cameras to get the best shots of all the mountain species. Today we will visit several highland areas to give everyone the best chance to photograph some of the most wanted bird species. Based on weather and time factors, we may visit Tolomuco Lodge, Batsu, or Savegre Lodge. We’ll be focusing on elevations between 1500-2500 meters to give everyone the best chance at capturing the Resplendent Quetzal, Golden-browed Chlorophonia, Long-Tailed Silky Flycatcher, and the Flame-throated warbler on film. We will return to the feeders at Quetzal Paradise Lodge for the late afternoon feeder activity. Today your birding photography adventure comes to an end. You WIll return to the San Jose International Airport to check in for your flight home.